2 PACK ENERGIZER LITHIUM 123 CR123A 3V BATTERY NIB. BEST BEFORE 2027. WE WILL RESPOND IN LESS THAN 24 HOURS. 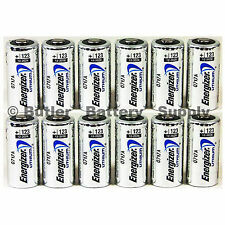 Streamlight 85177 CR123A Lithium Batteries, 12-Pack FREE SHIPPING!!! Features:- high-performance batteries, optimized for high-drain use in flashlights- 10-year shelf life- wide temperature tolerance- built-in heat and fault (short-circuit) protection- made in the USA to SureFire specifications"" . Replaces: 123, 123A, BR2/3A, CR123, CR123A, CR123R, CR17335, CR17345, DL123A, EL123AP, K123LA, L123A, SF123A, VL123A, 5018LC. This high grade battery features Lithium Manganese Dioxide, which provides exceptional capacity and performance compared to alkaline batteries. Optimized for use in SureFire flashlights. Battery Size: CR123A. Associated Battery Sizes:123, 123A, 2/3A, 5018LC, BR2/3A, CR123, CR123A, CR17335, CR17345, CR23, DL123A, EL123A, K123LA, L123A, SF123A, VL123A. Dependable, long-lasting battery. Great for people who like to be prepared! 10 Years of Power (in storage). Replaces: 123, 123A, 123-SANYO, 5018LC, 6205, BR2/3A, CR123, CR123-2, CR123-A, CR123A, CR123A-2, CR123R, CR-123, CR17335, CR17345, DL123, DL123A, DL123A2, DL123AB, DL-123, DL-123AB, DLCR123, EL123, EL123A, EL123AP, EL123-AP, EL123AP2, EL123AP-2, K123, K123A, K123LA, K123LA-1, L123A, PL123, PR123-1, PR123-2, PRCR123-1, PRCR123-2, RL123A, RL123A-1, RL123A-2, SF123, SF123A, SF123A1, ULCR123R, VL123, VL123A. Energizer 123 CR123A CR123 123A. Replaces: 123, 123A, 123-SANYO, 5018LC, CR123, CR123-2, CR123-A, CR123A, CR123A-2, CR123R, CR-123, CR17335, CR17345, DL123, DL123A, DL123A2, DL123AB, DL-123, DL-123AB, DLCR123, EL123, EL123A, EL123AP, EL123-AP, EL123AP2, EL123AP-2, K123, K123A, K123LA, VL123a, SF123, LC5018. New Product Discount ! High Quality !!! 6 x NEW Energizer CR123A Lithium 3V Battery EL123AP. NEWEST Exp DATE 2028. Panasonic CR123A. Sanyo CR123A. Sreamlight CR123A. BatteryStation CR123A. Inova CR123A. Sony CR123A. Up for sale are 4 New Energizer CR123 3 volt lithium batteries. You will receive 4 batteries total sealed in mini resealable bags for added protection. Replaces: 123, 123A, 123-SANYO, 5018LC, CR123, CR123-2, CR123-A, CR123A, CR123A-2, CR123R, CR-123, CR17335, CR17345, DL123, DL123A, DL123A2, DL123AB, DL-123, DL-123AB, DLCR123, EL123, EL123A, EL123AP, EL123-AP, EL123AP2, EL123AP-2, K123, K123A, K123LA, VL123a, SF123, LC5018. 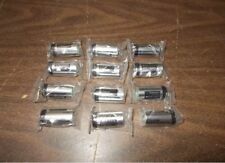 12x Surefire CR123A Lithium Batteries 3 Volts EXP. 11/2027 MADE IN USA 3x Battery Boxes. For all SureFire Lithium battery powered lights. Made in the USA to SureFire specifications. Replaces: DL123A, CR123A, EL123AP. 6pcs 1400mAh CR123A 16340 Lithium Li-ion Batteries Trustfire 3V Battery From USA. 6PCS Trustfire CR123A 3V Lithium Batteries ( battery is not charging ). 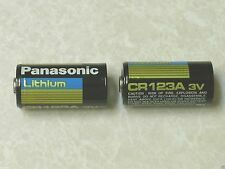 CR123A lithium battery Low battery models: CR123A. 4x EBL CR123A Battery. Equivalent to :123, 123A, CR123, CR123A, DL123A, VL123A, CR123R, BR2/3A, CR17335, CR17345, EL123AP, K123LA, L123A, PL123. Capacity: 1600mAh. Baterry Size :CR123A. Type :Lithium. 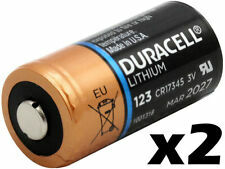 Duracell DL123A batteries are an exact equivalent for any and all CR123A applications. Replaces: 123, 123A, BR2/3A, CR123, CR123A, CR123R, CR17335, CR17345, DL123A, EL123AP, K123LA, L123A, SF123A, VL123A, 5018LC. Latest EXP 2028 date - FREE SHIPPING! 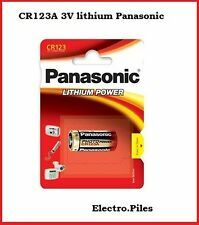 NEW PANASONIC CR123A Battery 2pcs. You may also like. Condition: 100% new. all products are original 100% authentic and never been used unless otherwise stated. But it may delay due to Custom / Weather. 8 x TrustFire CR123A Battery. Chemistry: Lithium. BUY 2 GET 1 FREE, BUY 3 GET 2 FREE, BUY 4 GET 3 FREE and so on. Widely used in LED flashlight, and other electronic products. ModelCR123A 3V Lithium Batteries. - Stable performance, small internal resistance. Coin/Button Cell Sub-TypeCR123A. 14xCR123A Battery. Energizer 123 CR123A Battery. Replaces: EL123AP / DL123A / CR123 / CR123A / K123LA. 2 x 3.7V 1800Mah 16340/CR123A Batteries. Type: Electric. DL 123A; EL CR123 AP; CR123A; K123LA; CR123R; CR17345. Panasonic CR123. Panasonic CR123A. Lithium Power. Other Information. Model : 16340( Replace for CR123A,, K123A, VL123A, DL123A, SF123A 123A ). Capacity: 1800mAh. of lithium is not a failure but scrapped. lead scrap. Material: Li-ion Battery. Replaces: 123, 123A, BR2/3A, CR123, CR123A, CR123R, CR17335, CR17345, DL123A, EL123AP, K123LA, L123A, SF123A, VL123A, 5018LC. DURACELL CR123A DURACELL 3V BATTERIES. FRESH LONGEXP DATE: 2028. Single-use lithium batteries are convenient ways to charge your frequently used tools. You can use the batteries with your flashlights, cameras, and power packs. The batteries are lightweight and ideal for traveling. What are the specifications of the CR123A battery? The battery size is CR123A, which is a standard 3V lithium battery.The element inside the CR123A battery is Lithium, which is a soft silver-white metal and the lightest of the alkali metals. The 123A has 3 Volts, telling you the power of the battery. The terminal type is button top, and the battery has a shelf life of 10 years. What voltage does the SureFire lithium battery use? The battery made of lithium uses 3 Volts. It has 1550 mAh of energy capacity to keep your tools running for a long time. The lithium battery works well with flashlights that use CR123A size. What are some uses for energizer batteries? 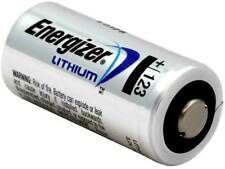 You can use the energizer lithium batteries for high-drain and high-tech devices. You can use lithium batteries in digital cameras, GPS, and MP3 devices. More uses include cell phone backup, halogen bulbs, and portable TVs. Plus, you can use them in motorized toys, music players, and flashlights. The batteries will last 10 or more years unused, depending on the battery type. It's important to use the same battery type for your device. Mixing battery types could cause leakage. What should you know about Duracell 123 batteries and usage? Duracell 123 batteries have up to four times the strength of alkaline batteries. Plus, the batteries have Duralock Power Preserve Technology. They are similar to using CR123 and CR123a batteries. 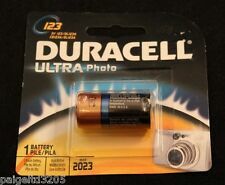 The Duracell 123 batteries have 3-volt lithium, which you can use to power photo equipment, stream light, firearm light, and tactical light. The minimum shelf life of Duracell 123 batteries is seven years. What are some features of the Tenergy 123A lithium battery? The 123A made of lithium is a 3-Volt battery that is excellent for industrial applications. You can use the CR123A to replace the CR123. It can be to power photo equipment, light meters, dog collars, and security cameras, flashlights, tasers, electronic cigarette devices, and cameras to name a few. The Tenergy 123A battery made of lithium is non-rechargeable, but will last three to five times longer than alkaline batteries when used in high-drain gadgets. It has a protection feature with a threshold of 5 amps that will prevent too much electrical discharge.